Arden Griffins lingering hopes of a second title almost came unstuck when they scraped past a resurgent Ernesford Eagles 74-66. Whilst Tile Hill Trojans 1 have the top spot virtually wrapped up, Griffins are probably the only side who can upset the Coventry club’s aspirations, and their game against Eagles should have been a formality. But Ernesford produced a late challenge and Griffins heaved a sigh of relief that there were not another couple of minutes play when the buzzer signalled the end of an exciting game which the Solihull side had dominated for long periods. Leading 66-48 with eight minutes left, Griffins offense suddenly dried up and Eagles pounced to come back to within eight when the end came. It was another night of triumph though for Arden’s three-point hot-shots Luke Hatfield and Paul Roberts, who bagged thirteen between them with Roberts netting ten of them for a thirty point match haul as Mauro Goncalves led for Eagles with 17. 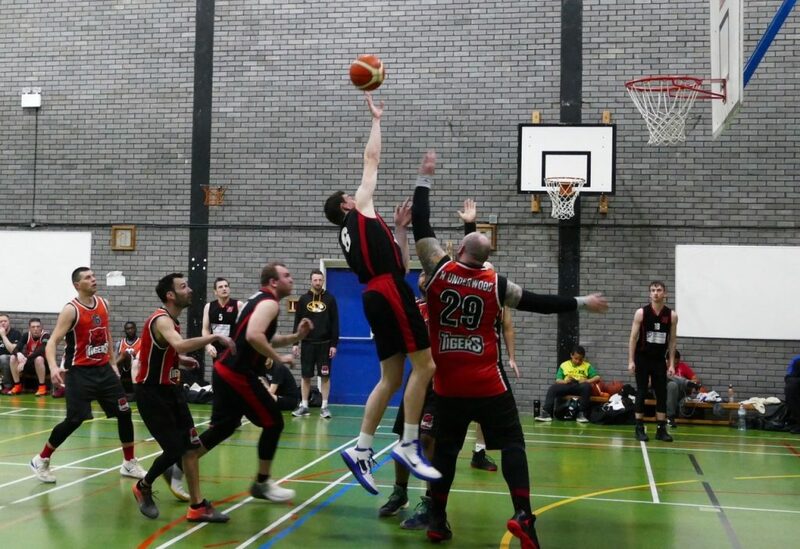 Trojans march towards more honours continued as they brushed aside the challenge of Aylesford Hawks who were completely out of form at Moreton Morrell with Trojans winning all four quarters on their way to a 74-54 victory. The usual sublime performance of Ricky Fennell was noticeably absent as the Hawks’ sharpshooter scored just seven points and he fouled out early in the final quarter to deprive Coach Jim Martin of any hopes of a come-back. Trojans, on the other hand were ebullient as Ash Dickson grabbed 21 points and Scott Owen iced the cake in the last few seconds with a couple of long-range triples. Tamworth Tigers pounced on JM Grizzlies at Rawlett School to land an 82-45 win after a lightening start saw Tigers race into a 34-16 lead. Defences dominated the second quarter and from then, it turned into the Lukasz Bolda show and the Tiger hit 17 of the next 22 points to seal a fine victory before ending the game on 28. Coventry College had a terrific shooting evening at Tile Hill Trojans 2 as Vaidas Cerkunovas excelled once again with 32 points as a Trojans side, weakened by injury and work commitments struggled. Once College had taken the lead after trailing 9-4 there was no stopping them and a deluge of points in the third quarter took the game from 45-37 to 64-39 and that was that. In Division Two leaders Rugby had no game but there were wins for Westwood Rhinos and Team Rebels who gained revenge at Trojans 3 for their defeat seven days earlier. The Hereward visitors were much stronger than their previous trip to the College and were in control until Trojans hit ten between them inside two minutes to bring the scores to 49-55, before Rebels had the last laugh. Rhinos were too good for Nuneaton Predators and took the first and last quarters to land a 60-46 win with James Todd sparkling on 24 as Rhinos consolidated their second spot. ← FOUR GO THROUGH TO SEMI FINALS!